Golda Meir (Hebrew: גּוֹלְדָּה מֵאִיר) (born Golda Mabovitz; May 3, 1898 – December 8, 1978) was one of the founders of the State of Israel. Meir served as the Minister of Labor, Foreign Minister, and from March 17, 1969 to April 11, 1974 as the fourth Prime Minister of Israel. Golda Meir was the "Iron Lady" of Israeli politics years before the epithet was coined for Margaret Thatcher. David Ben-Gurion once described her as "the only man in the Cabinet." She is the first (and to date the only) female prime minister of Israel, and was the third female prime minister in the world. 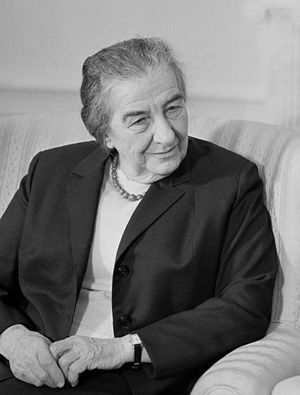 Golda Meir rose from a humble background to a position of leadership on the world stage and was present at her nation's birth, being one of twenty four people who signed the Declaration of the Establishment of the State of Israel in 1948. Inclined toward peace, she was a reluctant war-maker, but in her position as Prime Minister of Israel when the country's athletes were killed at the 1972 Munich Olympic Games and also when her country was attacked in 1973 she led the country in responding decisively. Meir was convinced that a strong State of Israel was the best hope for her people's survival, yet despite the belligerent situations faced by her government, she wanted peace with her Arab neighbors. Meir was born as Golda Mabovitz in Kiev, Ukraine, then part of Imperial Russia, to Blume Naidtich and Moshe Mabovitz. Golda wrote in her autobiography that her earliest memories were of her father boarding up the front door in response to rumors of an imminent pogrom. The family was very poor and living conditions in the pale of settlement (areas where Jews could live) were tough. She and her two sisters (Sheyna and Tzipke) were often hungry and cold. Her other five siblings had died in childhood. Moshe left for the United States in 1903. The rest of the family stayed in Pinsk. Meir looked up to her big sister Sheyna, and admired her Zionist-Revolutionary activity. But the volatile political environment meant Sheyna's safety and perhaps the Mabovitz family was at risk because of her work. Finally this compelled the rest of the family to follow Moshe to the United States in 1906. The Mabovitz family settled in Milwaukee, Wisconsin. There, Meir's father worked as a carpenter and her mother ran a grocery store. When Meir was only eight years old, she managed the responsibility of overseeing the store for a short time each morning while her mother bought supplies at the market. Golda Meir attended the Fourth Street School (now Golda Meir School) across from the Schlitz Brewing Complex from 1906 to 1912. It was here that Meir undertook her first service project, organizing a fund-raiser to pay for her classmate's textbooks. After forming the American Young Sisters Society, she rented a hall and scheduled a public meeting for the event. When Meir was 14 she began attending North Division High School, taking part-time jobs to pay expenses. She showed unstoppable determination to further her education. When her mother suggested that she give up school to work and marry, Meir ran away to Denver, Colorado, where her older sister Sheyna was living. She stayed for about a year in a duplex at 1606 Julian Street in Denver. Meir attended North High School and met her future husband, Morris Myerson, also a Russian immigrant. In 1913 Meir returned to Milwaukee and re-enrolled at North Division, graduating in 1915. Despite not knowing English when she arrived in U.S., Meir graduated as valedictorian of her class. From a very young age, Meir believed strongly in the need for Jewish sovereignty so that Jews could be masters of their fate. She also was passionate about a vision for a society based on justice and equality that did not allow exploitation. Following high school graduation, Meir became involved in Zionist causes. She was an active member of the youth movement, Habonim (which merged with the like-minded Dror in 1982 to form Habonim Dror). She participated in public speaking at meetings and often advocated for Labor or Socialist Zionism. Meir formally joined the Labor Zionist Organization in 1915. Upon her graduation from the Milwaukee State Normal School (now University of Wisconsin-Milwaukee, where the library is named after her) she taught in the public schools. Meir and Morris Myerson married in 1917 and began planning to make aliyah (emigration) to the land of Israel, then part of various Ottoman provinces. The couple and her elder sister Sheyna emigrated to the British Mandate of Palestine in 1921. Meir and Myerson applied to join a kibbutz (communal farm), Kibbutz Merhavia. They were turned down at first, but eventually were accepted into the community. Meir's duties included picking almonds, planting trees, caring for chickens, and running the kitchen. She thrived in this environment where responsibilities were shared equally among members. She also began to emerge as a leader. Her kibbutz chose her to represent them at Histadrut, the General Federation of Labor. By 1924, Morris had grown tired of the kibbutz life. They left the kibbutz, moving briefly to Tel Aviv, before settling in Jerusalem. There, they had two children, a son, Menachem, and daughter, Sarah. In 1928 Meir was elected secretary of the Women's Labor Council of Histadrut. This required her to move to Tel Aviv. Morris opted to stay in Jerusalem while the children moved with Meir to Tel Aviv. Morris and Meir grew apart but never divorced. Morris died in 1951. Meir's influence grew in Histadrut, which evolved into a shadow government for the yet to be born nation of Israel. In 1946 the British cracked down on the Zionist movement in Palestine. They arrested many of its leaders. Meir, however, was never arrested. She gradually took charge of the organization. She negotiated with the British, but also kept in contact with the growing guerrilla movement, demonstrating her natural capacity for diplomacy. During this time, Meir was keenly aware of the plight of Jews in Europe. She lamented, "We have many grievances against the British government. But the chief accusation that we have is that the policy of Britain's White Paper forced us to sit here helpless at a time when we were convinced we could have saved hundreds of thousands." Meir was one of twenty-four people (and one of two women) who signed the Declaration of the Establishment of the State of Israel on May 14, 1948. She later recalled, "After I signed, I cried. When I studied American history as a schoolgirl and I read about those who signed the U.S. Declaration of Independence, I couldn't imagine these were real people doing something real. And there I was sitting down and signing a declaration of independence." The following day, Israel was attacked by joint forces from Egypt, Syria, Lebanon, Jordan and Iraq. Meir was issued Israel's first passport and went to the United States to raise money for the fledgling nation. When she returned, she was assigned to be the first ambassador to the Soviet Union. She served there briefly, leaving in 1949. During her stay in Moscow, she attended High Holiday services and was mobbed by thousands of Russian Jews chanting her name. Stalin's repression of Jewish identity in the Soviet Union made many observers wonder whether there was still a strong sense of community, but the crowd's welcoming treatment provided the answer. The picture on the back of Meir's Israeli Shekel banknote is that of the crowd in Moscow surrounding her and lifting her in happiness. Upon her return from Moscow, Meir entered the Knesset (Israeli Parliament) where she served continuously until 1974. From 1949 to 1956, Meir was the Israeli minister of labor. In 1956, she became foreign minister under Prime Minister David Ben-Gurion. The previous foreign minister, Moshe Sharett, had ordered that all members of the foreign service Hebraicize their last names. Still using her last name of Mabovitz, Meir had ignored that order as ambassador, but now that she was becoming foreign minister herself, Ben-Gurion asked Meir to change her name to a Hebrew name. She chose Meir, meaning "illuminating." During her tenure as foreign minister, Meir spoke on the world stage, insisting on the need for Arab nations to accept the right of Israel to exist. She also spoke to the United Nations General Assembly in 1956 on behalf of Hungarians being deported by Soviet authorities, saying, "My delegation cannot refrain from speaking on this question. We have had such an intimate knowledge of boxcars and of deportations to unknown destinations that we cannot be silent." In the early 1960s she was diagnosed with lymphoma, which she kept hidden because she thought others might deem her unfit for service. Meir resigned from the cabinet in 1965, citing illness and exhaustion from her years of service. At first, she returned to her modest life, but she was soon called back into service. She served as secretary general of the Labor Party for eight months and retired again on August 1, 1968. After Prime Minister Levi Eshkol died suddenly on February 26, 1969, the party chose her to succeed him as prime minister. Meir came out of retirement to take office on March 17, and served in that role until 1974. When Meir became prime minister, Israel was brimming with confidence, having won a decisive victory over the Arabs and capturing large areas of territory in the Six-Day War. Nonetheless, Meir had to deal with the continuing Egyptian shelling of Israeli forces along the Suez Canal in the War of Attrition. She agonized over the continuing military strife. Following the 1972 Munich murders at the summer Olympic Games, Meir appealed to the world to "save our citizens and condemn the unspeakable criminal acts committed" . Meir and the Israeli Defense Committee felt that the world did not adequately respond and therefore authorized the Mossad (Israeli secret service) to kill operatives of Black September and PFLP (Popular Front for the Liberation of Palestine) wherever they could be found (Morris 1999). The 1973 Yom Kippur War was instigated with a surprise attack by Egypt and Syria in an attempt to reclaim the Sinai Peninsula and the Golan Heights, which had been captured by Israel in 1967 during the Six-Day War. Israeli intelligence was never entirely sure if war was impending. The day before the war began, Israeli intelligence was finally able to verify that war was indeed imminent. Six hours before the war was set to begin, Meir met with Moshe Dayan and Israeli general David Elazar. While Dayan argued that the war might not even start, Elazar wanted to launch a pre-emptive strike on Syrian forces. Meir considered both options and then decided not to launch a pre-emptive strike. Meir made this decision because she knew that Israel could not depend on European countries to supply Israel with military goods as European countries were under the threat of an Arab oil embargo and trade boycott. The only country in the world that would come to Israel's assistance would be the United States. Meir feared that by launching a pre-emptive strike, the U.S. would be less likely to assist Israel if the need arose. This was a good decision, as the U.S. launched Operation Nickel Grass. Henry Kissinger verified Meir's fears by stating that if Israel had launched the pre-emptive strike, Israel would not have received "so much as a nail." The war lasted 20 days, from October 6 to October 26, 1973, when a UN ceasefire was put in place. Through this conflict, the Arab world felt vindicated after their humiliation in the Six-Day War and conditions were set that helped to make the subsequent peace process and normalized relations between Israel and Egypt possible. Following the 1973 Yom Kippur War, Meir's government was clouded by internal squabbles among the governing coalition and had to face serious questions over strategic misjudgments as well as the general lack of leadership that resulted in the unanticipated Yom Kippur War. On April 11, 1974, Golda Meir resigned leadership, and was succeeded by Yitzhak Rabin. On December 8, 1978, Golda Meir died of cancer in Jerusalem at the age of 80. She was buried on Mount Herzl, in Jerusalem. ↑ Female prime ministers before Meir were Sirimavo Bandaranaike of Sri Lanka and Indira Gandhi of India. Meir is the only former American citizen to become Israeli prime minister. Meir was the first female head of state, or head of government, to oversee a nuclear weapons program. She was later followed by Margaret Thatcher and Indira Gandhi. This page was last modified on 24 June 2017, at 15:53.